I have gone for three concerts so far. I have found them all quite fun. My heart vibrates a lot with the loud sound and I quite like that feeling. And the fact that one gets to see a celebrity. The first concert I went for was Shakti 2006. That wasn’t a real concert, because one, we had to sit; two, my heartbeat remained normal through it; and three, the crowd was quiet and didn’t stand up or scream. But the players played quite well. There was Zakir Hussain, Shankar Pandey and a few more. The second concert was by Akon. That was a real concert. It involved standing, screaming, dancing and singing along. Akon is a real celebrity. He is very daring because he would jump into the crowd and even tried to push the barricade down between the paid categories. But the concert was very short for what I had paid for it—Rs.2000. It was only one and a half hours. I also had to miss my school trip for it. Akon sang very well, his band members were really good, especially his DJ. I am glad I went for it. 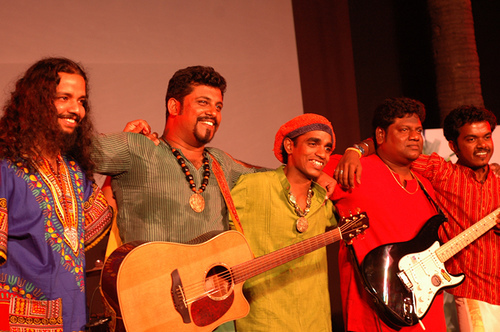 The last one I went for was of the “Raghu Dixit Project.” They are a South Indian Band who play Indian rock. One of my father’s friends, Gaurav Vaz is the bass guitarist for the band. Since all their performances are for invitees only, we get invited to the Delhi performances because of him. They are a really energetic band as they jump around a lot. The lead singer, Raghu will ask you to stand and sing along and join him in jumping or singing. The drummer has a lot of power and plays really well; the violinist plays in the background and does a fabulous job too. The lead guitarist, Vijay Joseph would make funny expressions and play fantastically. Although, sometimes I couldn’t tell whether the marvelous guitar sound was by the bass guitarist or the lead guitarist. Then Raghu, the lead singer and acoustic guitarist jumps and moves around a lot. The entire group is animated, and has a lot of fun while providing it to the audience. At the end of the concert we got to meet each band member too. They are all very polite and gentle. They crack jokes and make you laugh a lot. I liked this concert and the band a lot! I’m going to be looking forward to their new releases. My connection with music is also through my playing piano. I have just finished grade 3, can play a few familiar pieces and want to learn more. I’d like to be able to play Fur Elise and The Entertainer at the very least. I also listen to music on my mp3. My current favourites are Linkin Park, Eminem, 50 cent, Nirvana, Red Hot Chilly Peppers, Santana, Metallica, 3 doors down, Jonas Brothers and a few more. I love music. Once, during our summer break, my friends and I formed a band and made a piece of our own but never got to playing it anywhere. I was the singer for the band. Our band was called, “The Wilderness.” Our first song was called “Where I Belong.” For now the band has been lost in the wilderness! I’d like to end by saying Music’s In My Soul (a song by Jonas Brothers)! Thanks Kabir for the brilliant review 🙂 it was great to know that you liked our music and infact, encouraging for us that we can connect with your age group as well! I will keep you updated when we play again in Delhi or wherever you are! PS: You always feel the bass and not hear it :p !! Super cool. I nearly came for this event but something happened.. I forget what… Next time! @krishnan: Thanks, I will be writing one very soon. Keep an eye out for them. @Gaurav: Glad to see a comment from you. I really liked the style of playing and told all my friends about your band. Thanks for telling me about the bass. @Mala: The concert was amazing. You really should have come. I’m sure the excuse for not coming must have been something important, anyways thanks.